There are 972 items available. Please enter a number less than or equal to 972. Quality product at a competitive price, and the cats love it! This item was to replace an earlier one of the same type, so fitting was even easier than usual. Quality is very robust, and the multi locking system is brilliant. The bottom left hand side on the inside when locked is quite flexible. 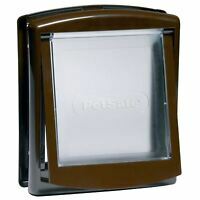 I was worried my cat, new to a cat flap would force it open and damage the cat flap. Also, I have had to open the locking surround until he is use to using it as it is quite heavy or heavier coming in than going out. Hope this is helpful. It looks very nice and working well as I have it. 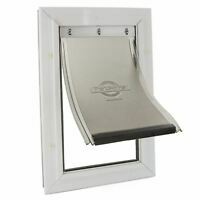 This is always our 'go to' product as it's the one we've used for years on the back door. Easy to fit. 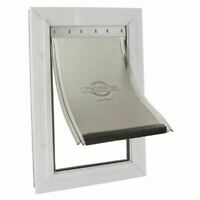 Our previous white cat flap was about 7 years old and our cat headbutted it open until it broke because a member of our household had stupidly locked it!! Cat came to no harm and is fine. Would buy this product again and again. Unfortunately one of the mechanisms in the cat flap did not work, the small red latch (not the locking device). Such a shame as I really looking forward to using this. 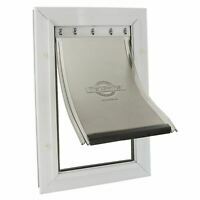 Good product,it's a little awkward to fit in a brick wall,extensions are flimsy. Not easy to fit in a solid brick wall,otherwise it's a decent buy.